Police departments around the nation are faced with tight funding, so they value any tool which helps expand their surveillance coverage and make the best use of their valuable personnel. Mobile Pro System’s Commander 3400 mobile surveillance trailer is one such device. With a 36-foot telescoping mast topped with high definition cameras, it provides an extra set of 24/7 eyes to make law enforcement easier and more effective. 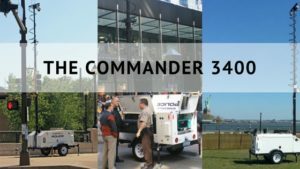 We’ve provided these tools to police departments around the nation, who share stories about the positive impact of placing the Commander 3400 in problem areas. When they’ve identified an area with frequent criminal activity such as drug dealing or street crime, it takes just one person to tow the trailer-mounted device to the area and set it up, without need of any tools. Deterrence begins immediately: it’s clear to criminals that video surveillance is taking place, and they’re not willing to risk video footage being used as evidence against them in court. Neighbors quickly note the reduction in criminal activity, often begging the police department to maintain the trailer on location long term, to prevent crime from returning. Word spreads to homeowner and neighborhood associations, who pinpoint trouble spots requiring extra attention and request placement of the device. It simultaneously reduces crime, gathers evidence, and provides reassurance to citizens, at a fraction of the cost of deploying officers on the ground. The Commander 3400 can also be placed to quell chronic disturbances, such as gatherings of unruly youths in public parks associated with fighting, gang activity, gambling or graffiti. At festivals, concerts, parades and other gatherings, it supports police efforts to keep the peace while instilling confidence and a sense of security in the public. Law enforcement values the device for its easy mobility and quick setup: They can deploy it when and where it’s needed. With these digital eyes on the street, they can maximize their staff where they’re needed. Digital surveillance is a cost-effective complement to traditional policing. With power options ranging from solar to generator to battery, it enhances security around the clock. Remote viewing enables authorities to monitor activities, and two-way audio enables them to address suspects from the station. Mobile surveillance systems are an increasingly essential tool for police forces as decreased funding demands efficiency. To learn more about the features and benefits of the Commander 3400, read more here or call us at Mobile Pro Systems.